If you’re expecting a motivating behind-the-scenes look at how bodybuilders prepare for a contest, a la Pumping Iron, you won’t find it watching Off Season—and that’s a good thing. 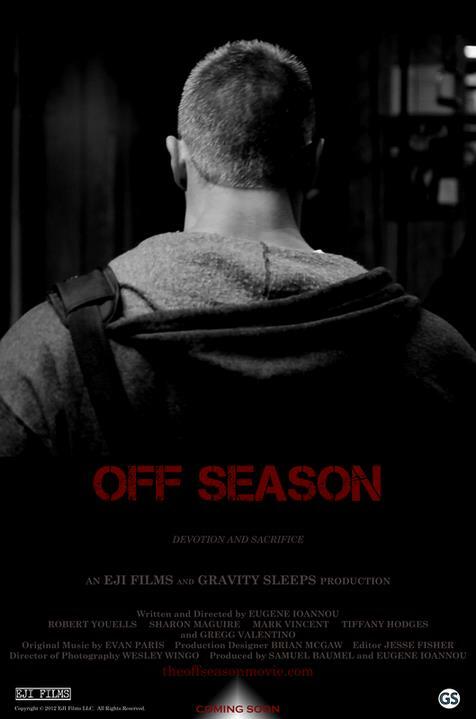 Created by young filmmaker Eugene Loannou, Off Season is a fascinating short film that brilliantly draws a parallel between the insecurities and emotional shortcomings of Donnie, an aspiring bodybuilder, and those of Mara, a New Jersey–based real estate agent. The most astonishing thing about this film is the extreme depth that Eugene Loannou goes to, peeling back the layers of the main characters until their broken cores are exposed. A drama in every sense of the word, Off Season quickly paints a picture of a newly formed relationship between two individuals from two completely different worlds. An attractive woman in her own right, Mara, played by Sharon Maguire, simply oozes desperation to find a partner who will curb her loneliness and insecurities, while Donnie, played by Robert Youells, is a social recluse with body image issues who can only find solace in the weight room. The interactions between the two characters are painful and awkward to watch as they lack that spark of enthusiasm and genuine interest in one another typically found in most new relationships. Zero chemistry aside, it doesn’t take long for the two to share a bed, prematurely fast-tracking their relationship to the point where Mara decides to showcase Donnie at a friend’s engagement party, using him as a tool to stifle her own insecurities about not being married. But when Donnie decides to opt out of the party to network at a local bodybuilding contest on the advice of his new mentor, Craig, the floodgates of emotional baggage burst open for both characters, leading to the ultimate demise of their short-lived relationship. Two things really stand out in this film: One is the way Loannou opened the door to the bodybuilding world unknown to most people, using incredible black-and-white training montages and footage from an actual bodybuilding contest. The other is Robert Youells himself and how he is able to let the audience into the mind of Donnie. From the tone of his voice and the uneasiness of his body language to the way he seems threatened by anyone who is physically his match yet intentionally conceals his own astounding physique, Youells’s performance is simply incredible—he really nails this part. Whether you’re into bodybuilding or not, Off Season is a film that all can appreciate, and if you’re familiar with the infamous Gregg Valentino, you’ll be pleasantly surprised. For more info on this bodybuilding documentary, click HERE.